Big Change is the current news from Invacare. Gone are the MG, Tracer EX and Tracer DLX. Replaced by the NEW Tracer EX2! The Invacare IVC Tracer EX2 wheelchair sets the new standard in manual wheelchairs. The Tracer EX2 combines the design and technology of the Invacare 9000 series and incorporates it into the Invacare Tracer series. A true dual axle position allows for repositioning the 24" rear wheels and 8" casters for adult and hemi seat-to-floor heights. 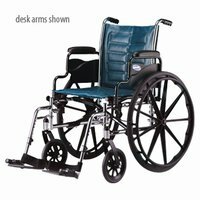 Offset permanent arms offer full seat width up to 20" with a permanent arm, hemi spaced footrest, full range of accessories and a lifetime warranty. The new design also makes it possible to interchange components with the 9000 series chairs. Meets RESNA standards for manual wheelchairs in product performance.